Persistence Market Research in its recent report “Allergic Rhinitis Treatment Market: 2016–2024,” examines the global allergic rhinitis treatment market for the period of eight years. i.e. 2016-2024. The primary objective of the report is to offer insights into developments in the allergic rhinitis treatment market that are significantly transforming global businesses and enterprises. This report covers the global allergic rhinitis treatment market performance in terms of revenue contribution from various segments. This section also includes Persistence Market Research’s analysis of key trends, drivers, restraints and opportunities, which are influencing the growth of the global allergic rhinitis treatment market. Impact analysis of key growth drivers and restraints are included in this report to better equip clients with crystal clear decision-making insights. This report demarcates market dynamics that are predicted to influence the current market and the future status of the global allergic rhinitis treatment market between 2016 and 2024. The report commences with the market overview which explains the market and provides market definitions. The section that follows discusses market dynamics including market drivers, restraints, opportunities, trends and key regulations. Through extensive research, Persistence Market Research provides useful insights to market players to plan their business strategies capable of adapting to the changing market landscape. The report also indicates the segment wise forecast of the global allergic rhinitis treatment market along with overall scenario in the assessment period. The publication focuses on identifying opportunities in the market and present updates and insights pertaining to the various segments of the global allergic rhinitis treatment market. A top-down approach has been used to assess market numbers for each product category, while bottom-up approach has been used to counter validate the market estimations. Several macro-economic indicators have been considered to arrive at the indicated market numbers. This report begins with Y-o-Y growth and anticipated growth projections of the global allergic rhinitis treatment market. It further covers market overview which includes definition and applications of the market. The market taxonomy section segments the global allergic rhinitis treatment market on the basis of treatment type, disease type, route of administration, distribution channel, and region. The last section of the report covers the competitive landscape that provides a dashboard view of companies that provide services in the global allergic rhinitis treatment market. The report contains company profiles of some of the key players and the strategic overview of mergers and acquisitions along with their expansion in different regions. Data points such as regional split and market split are analyzed and qualitative inputs from primary respondents have been incorporated to arrive at suitable market estimates. The forecast presented in the report evaluates the total revenue that is estimated to be generated across the global allergic rhinitis treatment market during the forecast period (2016–2024). When developing the market forecast, the starting point involved sizing up the current market, which forms the basis for forecasting how the global allergic rhinitis treatment market is anticipated to take shape during the assessment period. Given the characteristics of the market, Persistence Market Research triangulated the data on the basis of various analysis based on both supply side and demand side. The report not only conducts forecasts in terms of CAGR but also analyzes the market on the basis of key parameters such as Year-on-Year growth to understand the predictability of the market and to identify the right opportunities in the global allergic rhinitis treatment market. 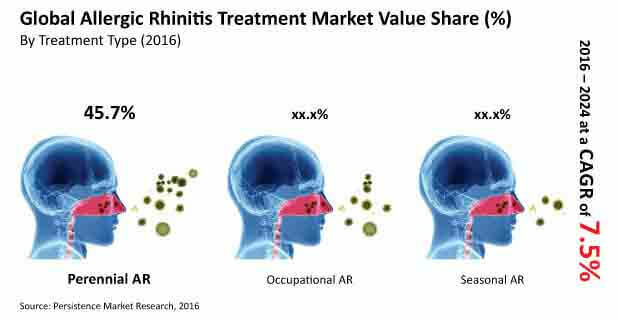 All the segments of the global allergic rhinitis treatment market have been analyzed in terms of Basis Point Share (BPS) to understand the individual segments’ relative contribution to market growth. This detailed level of information is important for identification of many key trends governing the global allergic rhinitis treatment market. Another key feature of this report is the analysis of the global allergic rhinitis treatment market and its revenue forecast in terms of absolute dollar opportunity. This is usually overlooked while forecasting the market. However, absolute dollar opportunity is critical in assessing the level of opportunity that a provider can look to achieve, as well as to identify potential resources in the global allergic rhinitis treatment market. Further, in order to understand key market segments in terms of growth and performance of the global allergic rhinitis treatment market, Persistence Market Research has developed a market attractiveness index to help providers identify real market opportunities. Perennial allergic rhinitis segment is the largest segment in the global allergic rhinitis treatment market by disease type, which is estimated to represent more than US$ 7,000 Mn by 2024 end, or close to 47% market share, expanding at a CAGR of 4.0% over the forecast period. The perennial allergic rhinitis segment is projected to create incremental opportunity of more than US$ 2,000 Mn between 2016 and 2024 and is estimated to represent more than 50% of total incremental opportunity. Perennial allergic rhinitis segment is anticipated to be the most lucrative segment in the global allergic rhinitis treatment market, with a market attractiveness index of 1.5. A large patient pool and growing prevalence of perennial allergic rhinitis is expected to boost demand for treatment options over the forecast period. Over the past few decades, it has been noted that global per capita healthcare spending has increased considerably owing to increasing rate of awareness regarding the availability of myriad treatments and diagnostic methods for treating various diseases. Increasing healthcare spending is likely to result in increasing demand for better quality and rapid diagnostic methods, and in turn, create high growth opportunities for players operating in the treatment of perennial allergic rhinitis in the global allergic rhinitis treatment market. Respiratory disease places a huge burden on society in terms of disability and premature mortality, and also in direct health service costs, drugs prescribed and the indirect costs related to lost production. Perennial allergic rhinitis is frequently accompanied by allergic asthma. This condition is also impacting the global allergic rhinitis treatment market. Another factor which is fuelling the growth of the perennial allergic rhinitis segment in the global allergic rhinitis treatment market is the increasing awareness about perennial allergic rhinitis treatment among the patients across the globe. In order to increase awareness about allergic rhinitis, several government organizations have started awareness programs. For instance, Allergy UK is the operational name of the British Allergy Foundation that observes allergy awareness week from April 25 to May 1. In terms of value, North America is estimated to dominate the global allergic rhinitis treatment market with more than 60% revenue share of the overall allergic rhinitis treatment market in 2015. Europe is anticipated to be the second fastest growing market followed by the Asia Pacific market. The Asia Pacific market is estimated to witness high year–on–year growth in terms of revenue owing to growing awareness about perennial allergic rhinitis and the availability of good treatment options in the market. In the Asia Pacific allergic rhinitis market, the China regional market is projected to grow at the highest CAGR from 2016 to 2024. GlaxoSmithKline recently announced a new spray - intranasal steroid fluticasone furoate for the treatment of allergic rhinitis in the Philippines. Approved by the Bureau of Food and Drugs, the nasal spray is indicated for the treatment of seasonal allergic rhinitis and perennial allergic rhinitis in adults and children of the age group two years and older. Top market players are making strategic investments to bring in more innovation in their offerings to cater to the rising demand for treatment options in the global allergic rhinitis treatment market.